When Tires fall flat at a fork on the road! When you have a flat tire or punctured tire, bring your tire in to our NMT Oakville garage for your tire repairs or replacements. It is not easy for most people to know whether their tires need to be repaired or replaced. Our experienced experts can advise you correctly on whether your tire needs to be replaced, or if we can save you money and have the tire repaired. This article will give you some basic information and tips on understanding the health of your tire, to analyse the pros and cons of repair and replacement of your car tires. Why is Tire Repair or Replacement Required? The majority of tire repairs are related to general wear and tear, but the need for tire repair or replacement could also be directly related to improper usage, or accidents. Improper pressure maintenance, a flat tire, ripping of the tire, or tread damage are some of the causes for tire repairs or replacements. Overly or poorly inflated tires are not just a safety hazard while driving; they also impact the condition of the tire and its performance on the road. Make sure that you check your tire pressure frequently, including your spare tire. When a sharp object penetrates a tire, it can lead to a flat tire or a cut. Our expert mechanics can inspect the number of punctures or cuts and the depth of the damage, and then suggest repairs. Plugs, patches, sealants or on-the-wheel repairs must be avoided if you are driving on a long route. They can only provide your tire temporary relief until you can reach an auto body shop or tire specialist store. 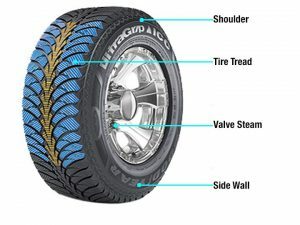 If the puncture is in the sidewall or near the shoulder, the tire must be replaced. If your tires and wheels are out of balance, you need to get it fixed quickly. This is not just a source of continuous noise during driving, but could also impact tire tread. Your tire tread is important for acceleration and brake functions; a lack of balance will make it worse. General wear and tear will lead to natural loss of depth in the tread. That’s when a tire replacement is required. Check the wear bars of your tires and see if they are indicating less than1.6 mm remaining. Simply ask our mechanics to inspect the general condition of the tread and the remaining depth. The Rubber Association of Canada suggests car owners and mechanics run the “dime test” to check your tread levels. If required, and tread levels are low, you should replace the tires. Do you regularly check your tires for air pressure? If not, then it will lead to sidewall flexing which can deteriorate your tire quality rapidly. When your vehicle is carrying extra weight (heavily loaded vehicle), it becomes important to increase the air pressure a little bit. We can advise you of the pressure requirement when car is over-loaded, or if you plan long trips. Tire Industry experts advise that tires should always be repaired or replaced by a trained and experienced tire service technician. Most auto garages and tire stores have their mechanics trained in tire repair and replacement. We highly recommend that you check with the garage about the credentials of the tire service technician before going ahead with a repair or replacement. If you want to keep your tires optimized for safe driving and high performance, it is important you keep your tires in good condition. We also advise our clients not to drive with tires that are beyond repair. Replace them and ensure your safety and that of others on the road. Need help choosing the right tires for your vehicle? Our team at NMT Oakville are highly trained experts who have the knowledge and passion to help. Just pick up the phone and call us, or let’s chat in person at our Oakville tire store. We love helping our clients get back on the road with confidence.